Like every business, distributors need accurate financial information to make sound business decisions. Acumatica’s Financial Management software includes the core set of financial applications, fully integrated with customer management and operational software for distributors and wholesalers for timely and accurate financial data. Each module has been developed to meet the needs of growing multi-national organizations, yet is affordable for small and midsize businesses. The Acumatica platform provides workflow, collaboration, analytics, and mobile throughout all components of the ERP and CRM solution set. “Leaders are marrying analytics and optimization tools with collaboration technologies to develop supply chain intelligence”. “Leaders are deploying solutions that give them integrated workflow and collaboration that increase timeliness and accuracy of their most critical data”. “Leaders are more engaged and have invested in mobility. In fact, up to 87% of leaders have a mobile solution now and 37% of all companies plan to invest in one within the next year”. Distributors have access to more data than ever before available, but many are challenged to turn that data into actionable information. Modern analytics allow distributors to collect, manage, and transform raw data into insights and intelligence to support decision-making. One of the characteristics of today’s Big Data is its variety: Unformatted text, images, scanned documents, sensor feeds, and more. A picture of a damaged item, for example, can be electronically attached to a returned product record along with a copy of an original invoice with hand-written notes. Integrating Document Management to Analytics brings this concept to life. The Acumatica wholesale distribution system monitors key metrics for each functional grouping. Drill down into summary and detailed information, including access to supplemental information, is immediately available. Executive management has immediate access to the performance measurement details for fast, accurate decision-making. These functions are part of the business dashboards that are central to Acumatica Analytics. Workflow allows you to define a consistent and repeatable pattern for a given business process and helps administer and monitor the execution of that process. Workflow maintains complete records and status tracking, so records and supporting documents are moved through the process as the defined steps are completed. For distributors, this means that the steps in processes are clear and visible and the potential for confusion or delay are greatly reduced. 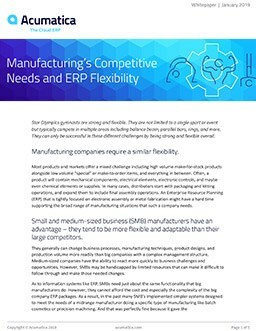 See how workflow tools can help streamline your business operations in Acumatica’s ERP software for distributors and wholesalers. Mobile devices are everywhere and business leaders rely on them to store information (calendars, telephone numbers), communicate (email, text), and supply answers to questions (search, maps). With Acumatica, distributors can now empower every employee to access fast, accurate, and relevant information on any device, anytime, anywhere. See how easy it is to add mobile solutions to Acumatica for use on any browser enabled device. 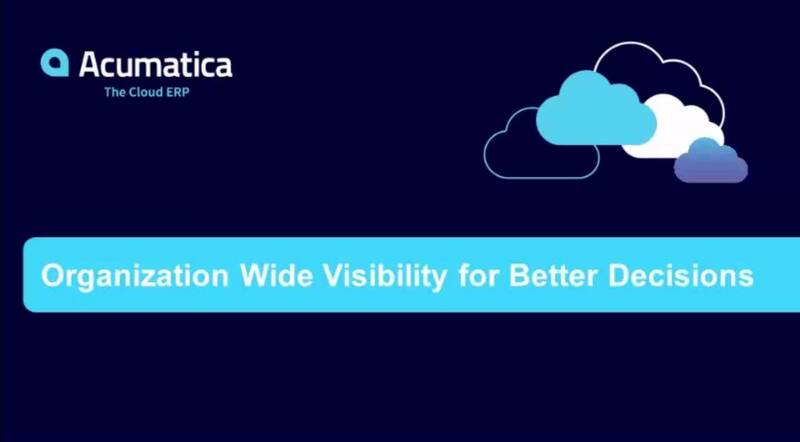 NOTE: This video features the “upcoming” app development in Acumatica 5.